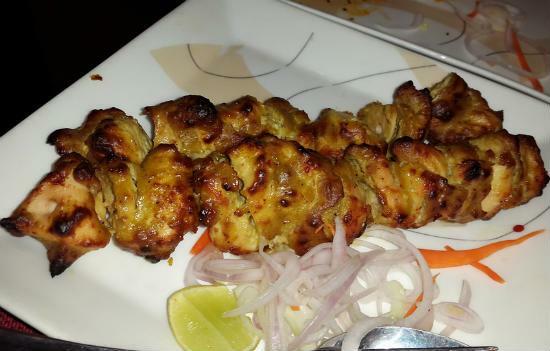 Reshmi Chicken Kabab is a delicious starter/appetizer dish where boneless chicken pieces are marinated in a mixture of curd, cashew nut paste and yogurt. 1. Chop the chicken into bite-sized pieces. 2. Grind the cashew nut with little water to make a thick paste. 3. Add the cream, ginger garlic paste, yogurt, garam masala powder and salt. 5. Rub this all over the chicken pieces and keep aside for 3 to 4 hours in the fridge. 6. Heat a grill pan over medium flame (You can also use a charcoal grill). 7. Skewer the chicken pieces and place them on the grill. 8. From time to time, baste them with the ghee and grill for about 3 to 4 minutes. 9. Remove and serve with lemon wedges and onion rings. Feel free to comment or share your thoughts on this Reshmi Murgh Kebab Recipe from Awesome Cuisine.